This ring is very popular, I have seen it for sale at several places but I knew nothing would match Stauer''s quality and I was not disappointed. This ring is not as large as some Stauer pieces and is really a great size for every day wear. I absolutely love this ring! I looked at other similar items, and this is the most delicate piece I''ve found. The porportions are perfect; it draws attention because for its apporpriate size. This is the most beautiful ring I''ve ever owned. Got it today and could not believe how amazing it is. I''ve already told my sister and a friend that they should think about getting one. Thanks for making this available at such a great price too. This ring was a surprise from my husband. It is absolutely stunning. I have received so many compliments on it. I am very happy with it. Best replica without being gaudy. The title says it all. I had looked for a similar ring, with a smaller profile and metal that wouldn''t make me break out (allergies). I searched many sites, and this ring seemed the best. Granted, when I put it on in the house, the center stone looked dark, and I was going to give it 4 stars. But when I left the house, on a gloomy day (no sun), it sparkled. Compared to Kate''s ring, it''s the same coloring-- just a smaller scale. The diamondaura stones actually refract light back when you try to photograph them. But... it does catch lint like a fiend, which means the prongs are poorly set. I paid $49 on an e-mail deal for the ring, but if I lose a stone due to the set, I''d never buy it or recommend it again. This is my first foray into false stones, but I have had sterling silver well set with natural stones. I have a ring that has been beaten to s**t (hematite and sterling, manufactured by an artisan in NM), but the natural stones are still held firm. I wear it every time I fly as an identifier, because the ring is THAT strong. If the setting fails, that''s on Stauer. I was so excited when I saw a couple of years ago that Stauer had the ring that I had love on Princess Diana. I had always wanted a ring like hers, but could not afford one. I bought my ring from Stauer, and have only taken it off maybe twice in the last two years. I love it; it is perfect on my hand; and it shows no signs of wear. I think highly of Stauer because of this ring. Absolutely beautiful ring. The color of the created sapphire is stunning. The size of the ring is perfect--large enough to be noticed but not too large. I ordered this ring about 5 days ago and received it today! I am very pleased with the ring. The sapphire is the right shade of blue and the diamondaura gems frame the sapphire without being gaudy This is a ring that will proudly wear just about every day. Great gemstones mounted in a setting that compliments the gems. I've never been disappointed with any jewelry that I've ordered fron Stauer and this is no exception. Absolutely gorgeous plus great quality! This ring is one of the most beautiful rings that I've purchased from Stauer. This ring will grace my hand everyday. I've always wanted a sapphire and diamond ring that was similar to Princess Diana"s engagement ring and now I own one. The gemstones are just the right size to not be gaudy but attract people to admire the ring. You've done it again, Stauer, in making me a lifelong customer! Now that the Wedding of the Century is complete, it might seem as though the celebrations should be over. But here at Stauer, we just can't stop. It might have something to do with that legendary sapphire that started it all. Every time we look at our spectacular Royal Proposal ScienzaÂ® Sapphire Ring we relive the magic all over again. And so can you! In 1981, Prince Charles slipped a brilliant blue sapphire onto the finger of shy Lady Di and the whole world fell in love. Nearly thirty years later, his son William used the very same ring to win the hand of his own beloved Kate. Immediately after Prince William announced his engagement, luxury jewelers across Europe were flooded with requests to create similar rings. But even the wealthiest patrons had to wait months for their own custom versions. We have one waiting for you right now. 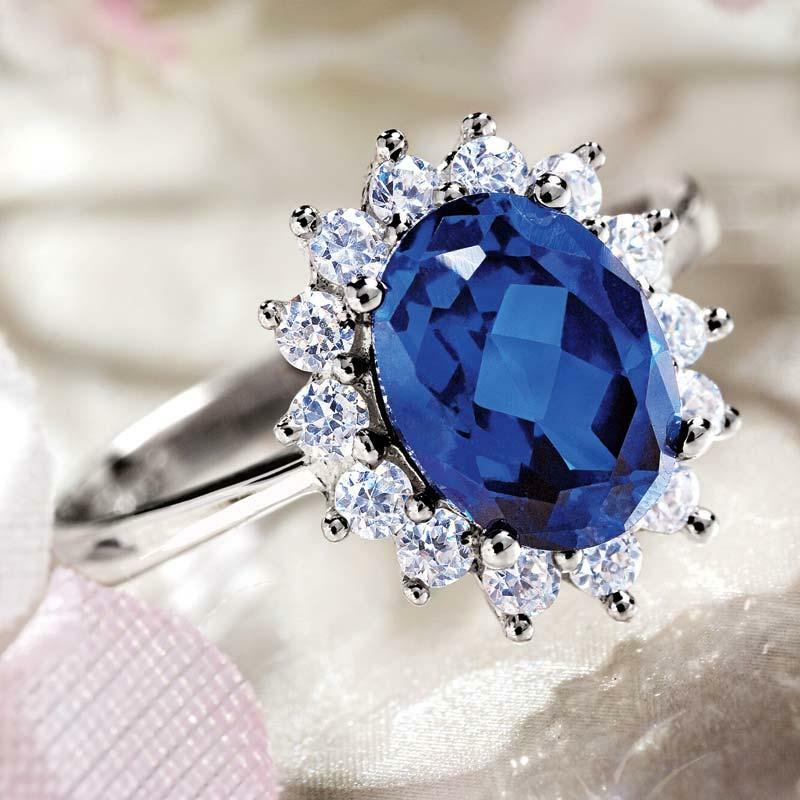 Our version features an impressive 2 5/8 -carat lab-created sapphire oval, prong-set in a band of sterling silver. The regal blue beauty is surrounded by a sunburst of 14 round DiamondAuraÂ®.